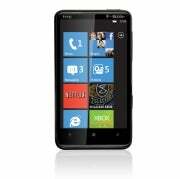 The HTC HD7 ($200 with a two-year contract from T-Mobile) has the specs of a high-end phone: It boasts a 4.3-inch display, a 1GHz Snapdragon processor, and a 5-megapixel camera, and it runs the brand-new Windows Phone 7 mobile operating system. But unlike the recent crop of top-of-the-line smartphones, the HD7 does not have a front-facing video camera. It also does not support T-Mobile's HSPA+ network, which delivers data speeds on a par with that of 4G networks. The HD7 is a great device for watching movies or browsing the Web, but it is odd that a front-facing videocam and HSPA+ support--which are becoming the norm for high-end phones--were omitted. If you were enamored by the HTC HD2's gorgeous hardware, but turned off by the fact that it ran Windows 6.5, you will be pleased with the HD7. It is almost identical in design to the HD2, but it has capacitive touch buttons rather than hardware buttons running along the bottom of the display. The hardware buttons on the side are smoother, too, giving it an overall sleeker appearance. Like the HTC EVO 4G (on Sprint also with a 4.3-inch display), the HD7 has a kickstand for tabletop video-watching. The kickstand pulls out from the camera's lens. Measuring 4.8 by 2.7 by 0.4 inches thick and weighing 5.7 ounces, the HD2 is kind of a beast. If you've got large jeans pockets, you should be fine. Ladies, forget about carrying this thing in your pocket. The phone is quite attractive, though, and is sure to turn heads out in the wild. Because of its resemblance to the EVO 4G, I was fully expecting the HD7 to have a front-facing video camera. Unfortunately, as mentioned, this isn't the case. By now, you probably know that Microsoft has created its new Windows Phone 7 from scratch. Now is the time to forget any preconceived notions you may have about Microsoft's mobile products. Windows Phone 7 is light, fast, and user-friendly. It isn't perfect, however. Missing features like copy/paste and true multitasking are big oversights. (Microsoft says copy/paste will come in an update in January.) I also don't find the WP 7 OS all that aesthetically pleasing or visually consistent, and navigating through it requires a lot of scrolling. For an in-depth look at the Windows Phone 7 OS, check out our hands-on review. Microsoft allows carrier and manufacturer partners to customize up to six tiles on the home screen. On the HD7, you'll find the HTC Hub, which gives you a taste of HTC Sense. HTC Sense is the overlay you'd normally get on an HTC-manufactured Android phone, like the EVO 4G. The HTC Hub has the lovely Sense weather app, which gives you a 3D-like visualization of your local weather. A few HTC-selected apps are also in the Hub. The HD7 is being marketed as the ultimate entertainment smartphone, and T-Mobile has thrown in a few apps to help you get started. The Netflix streaming app is definitely the most impressive, and it nicely showcases the HD7's generous display. The 1980s classic Teen Wolf ran smoothly with very little pixelation or distortion in our quick demo. The HD7 also comes loaded with the Slacker Radio app and T-Mobile TV, along with the XBox Live and Zune apps in WP 7. The HD7 also ships with 16GB of on-board memory so you'll have plenty of space to fill up with movies and photos. Microsoft requires handset manufacturers to ship WP 7 phones with a 5-megapixel camera or higher. The HTC HD7 sports a 5-megapixel shooter with a dual-LED flash. All WP 7 phones also must have a dedicated camera key, which I always appreciate. The camera/shutter key also wakes up the phone and brings you straight into camera mode, which is a nice touch. controls like Scene settings (auto, portrait, landscape, sports, beach, and so on), Effects (Grayscale, Negative, Solarize), as well as metering and resolution controls. Photos taken outdoors on a sunny day looked good: Colors were bright, and details appeared sharp. When I zoomed in on a distant building, however, my photo came out pretty blurry. My indoor shots looked overexposed, even with the flash off. Colors were a bit washed out and details were blown out. The HD7 captures video in 720p, as most high-end smartphones now do. My videos looked great, though the microphone is almost too powerful. The microphone picks up a lot of background noise--so much so that it is almost overpowering. Unfortunately, Windows Phone 7 doesn't have direct upload to YouTube in the gallery, which is another painfully obvious feature that the OS overlooks. As I mentioned before, the HD7 does not support T-Mobile's HSPA+ network; it supports HSPA 7.2 mbps download speeds. Just before getting the HD7, I had tried out the T-Mobile myTouch 4G and the T-Mobile G2, both of which support HSPA+, and was impressed with how quickly Web pages loaded when I got coverage. Although HSPA+ is still in the early stages of getting countrywide coverage, it is disappointing--and odd--that the HD7 was left out of this upgrade. I was unable to test the HD7's upload and download speeds as there is no Windows Phone 7 Ookla app available yet (for measuring network speeds). I did some casual speed tests over Wi-Fi, and found the browser, paired with the 1GHz processor, to be pretty speedy. PCWorld.com fully loaded in 22 seconds, media-heavy site Thrashermagazine.com loaded in 35 seconds, and NYTimes.com loaded in 16.2 seconds. One annoying issue I ran into was when I tried to sync my Facebook profile to the HD7. I'm not sure if this was a network issue or a problem with the operating system. It took about four tries to get my Facebook profile up and running. I also noticed that the phone seemed to switch between EDGE and 3G pretty frequently around San Francisco. Call quality was hit-or-miss over T-Mobile's 3G network. Callers sounded good, but slightly distant and a bit tinny. On a busy city street, my caller on the other end of the line had a difficult time hearing my voice. The HD7 is a high-quality phone, but without a front-facing camera or 4G data speeds, it can't compete with the T-Mobile myTouch 4G, Apple iPhone 4, HTC EVO 4G, or Samsung Epic 4G, which dominate the top spots on our Top 10 Phones Chart. If you're a T-Mobile customer longing for a Windows Phone 7, however, the HTC HD7 is a nice introduction to the platform and a great entertainment phone. Make sure you give Windows Phone 7 a test run, however, before purchasing. It has a few quirks as well as a few missing features, like copy/paste and Flash support. The behemoth HTC HD7 has some impressive specs like a 4.3-inch screen, 16GB of storage, and a 5-megapixel camera with 720p video capture, but it does not support T-Mobile's speedy HSPA+ network.